Organizations that need to plan their transition to the latest edition of ITIL®  will require a detailed mapping between ITIL V3 and ITIL 4: This page describes in detail where ITIL 4 has added new guidance, and how the contents in ITIL 4 can be traced back to specific elements of ITIL V3 2011. 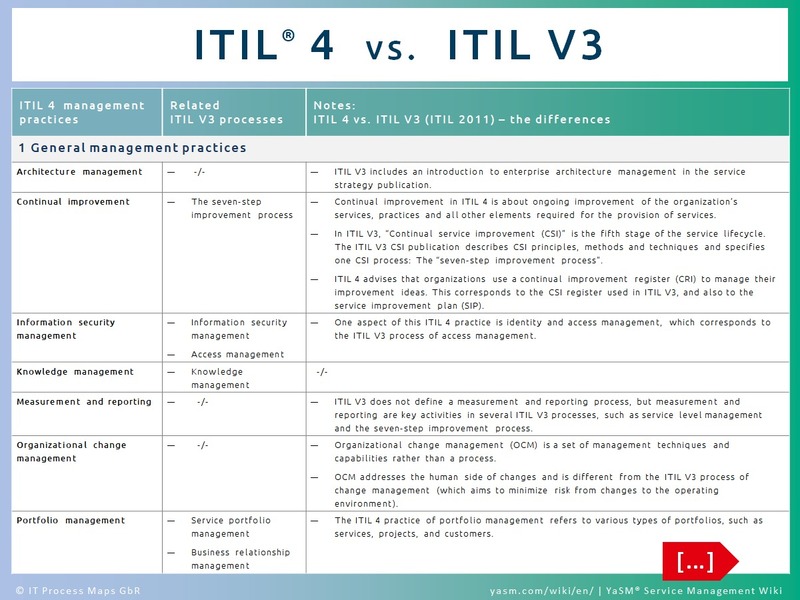 1 ITIL 4: What's new? 3 Has ITIL 4 dropped the ITIL V3 service lifecycle? 4 Where in ITIL 4 are the ITIL V3 processes? ITIL 4 - the most current edition of ITIL®  - was officially released in February 2019. As AXELOS state, "ITIL 4 expands on previous versions by providing a practical and flexible basis to support organizations on their journey to the new world of digital transformation". ITIL 4 is thus an evolution of the familiar ITIL framework rather than a revolution, and still uses many fundamental elements from the previous version ITIL V3, as first published in 2007 and updated in 2011 ("ITIL 2011"). In particular, many of the new ITIL 4 practices correspond to processes known from ITIL V3. Some of these concepts are discussed in the introductory chapters of the ITIL V3 publications (see chapter: Service management as a practice). ITIL 4 introduces a stronger focus on value creation and explains this concept in greater detail. These dimensions are applicable to the service value system in general and to specific services. ITIL V3 does not specifically describe a four dimensions model and the role of these aspects in service management but introduces service management as a "systems approach" with interconnected assets and service components. What is more, people, information, technology, partners and processes are key considerations in many ITIL V3 processes and other ITIL V3 guidance. While processes figure prominently in ITIL V3, ITIL 4 relates to processes as well as value streams, where value streams describe how value is created for customers and users. The service value system (SVS) is a new concept in ITIL 4. The SVS describes "how all the components and activities in the organization work together to enable value creation". ITIL V3, with its 26 service lifecycle processes, functions and other guidance arguably also describes how the components and activities in the organization work together. ITIL 4 and the SVS take a more holistic approach, providing organizations with a flexible operating model that supports different work approaches. ITIL 4 does not define specific processes, and service providers are free to design tailor-made processes that work for their organizations. The ITIL 4 guiding principles are universal recommendations that can guide organizations in many situations, such as "work holistically" and "keep it simple and practical". These guiding principles are not part of the original ITIL V3 publications, but they have been adopted from ITIL® Practitioner, a more recent addition to the ITIL V3 portfolio. The governance component of the ITIL 4 service value system is about directing and controlling the organization. ITIL V3 covers this topic in the service strategy publication. For each value chain activities, ITIL 4 outlines the key inputs and outputs. The central element in ITIL V3 is the service lifecycle with five stages: Service strategy, design, transition, operation and continual service improvement. This lifecycle is not identical with the ITIL 4 service value chain, but on a more detailed level many of the activities in the ITIL V3 service lifecycle processes broadly correspond to the value chain activities. The ITIL 4 model for continual improvement describes a structured approach to identifying and implementing improvements that can be used at all levels of the organization. The continual improvement model in ITIL 4 contains seven steps and is in some ways comparable with the seven-step improvement process known from ITIL V3. Instead of 26 processes, ITIL 4 presents 34 practices as "sets of organizational resources designed for performing work or accomplishing an objective". It is in these practices where the roots of ITIL 4 in ITIL V3 are most visible, because many of the practices correspond to ITIL V3 processes. Has ITIL 4 dropped the ITIL V3 service lifecycle? A key innovation of ITIL V3 was the introduction of the service lifecycle, consisting of five service lifecycle stages (service strategy, service design, service transition, service operation and continual service improvement). The ITIL V3 processes are distributed across this service lifecycle; for instance, the incident management process is part of the service operation stage. The idea behind organizing the ITIL processes in this way was to establish a Deming-like plan-do-check-act cycle focused on continual improvement. ITIL 4 has dropped most references to the service lifecycle, but continual improvement has remained a key concept. For example, continual improvement is an element of the ITIL 4 service value system, and the ITIL 4 service value chain with its six activities (plan, improve, engage, design and transition, obtain/build, deliver and support) is very reminiscent of the ITIL V3 service lifecycle. Where in ITIL 4 are the ITIL V3 processes? ITIL V3 defines 26 processes across the service lifecycle. In ITIL 4, these 26 processes have been replaced by 34 "practices". Some of them are new, but many of the ITIL 4 practices were formerly known as ITIL V3 processes (for a detailed cross-reference, see: ITIL 4 practices vs. ITIL V3 processes). So the ITIL V3 processes are still alive, and what is more, the authors of ITIL 4 state that ITIL V3 is still valid guidance that can be used for defining service management processes. But it is also worth noting that ITIL 4 is not prescriptive about processes, and gives service providers more freedom to design tailor-made processes that work for the organization. This presents an opportunity for a fresh start with ITIL processes, in line with the advice in ITIL 4 to "keep things simple and practical": The YaSM® process model describes a streamlined, clear-cut set of service management processes that is a good match for the leaner, more flexible operating models favored by today's service provider organizations. ITIL 4 includes updated guidance on multi-sourcing and service integration. These are key topics in the SIAM® framework. ITIL 4 embraces new ways of working, such as Agile, Lean and DevOps, as well as organizational change management. These management practices and their relevance for service management are also described in the VeriSM™ approach. The ITIL 4 service value chain is somewhat reminiscent of the VeriSM™ model, with key areas such as define, produce, provide and respond. ITIL 4 introduces the concept of a service value system. This fits in with a key requirement in the latest 2018 edition of ISO 20000 for organizations to "establish, implement, maintain and continually improve" a service management system. ITIL V3 includes an introduction to enterprise architecture management in the service strategy publication[a]. Continual improvement in ITIL 4 is about ongoing improvement of the organization’s services, practices and all other elements required for the provision of services. In ITIL V3, Continual service improvement (CSI) is the fifth stage of the service lifecycle. The ITIL V3 CSI publication[e] describes CSI principles, methods and techniques and specifies one CSI process: The "seven-step improvement process". ITIL 4 advises that organizations use a continual improvement register (CRI) to manage their improvement ideas. This corresponds to the CSI register used in ITIL V3, and also to the service improvement plan (SIP). One area of the security management practice in ITIL 4 is identity and access management, which corresponds to the ITIL V3 process of access management. ITIL V3 does not define a measurement and reporting process, but measurement and reporting are key activities in several ITIL V3 processes, such as service level management and the seven-step improvement process. Organizational change management (OCM) is a set of management techniques and capabilities rather than a process. OCM addresses the human side of changes and is different from the ITIL V3 process of change management (which aims to minimize risk from changes to the operating environment). The ITIL 4 practice of portfolio management refers to various types of portfolios, such as service, project and customer portfolios. The ITIL V3 process of transition planning and support, part of the service transition lifecycle stage, is primarily about planning and coordinating service transition projects. The ITIL 4 practice of project management is broader in scope. It aims to ensure that all projects in the organization are completed successfully. Relationship management in ITIL 4 refers to relationships with all stakeholders of the organization, including customers. Risk management is not on the list of ITIL V3 processes, but risk management techniques are described in several ITIL V3 processes, and ITIL V3 calls for "coordinated risk assessment exercises". The ITIL 4 practice of supplier management includes new guidance on multi-sourcing and service integration (an established concept from the SIAM® framework). ITIL 4 has dropped the ITIL V3 term underpinning contract (UC) and uses more generic terms instead (contract, agreement, warranty requirements, etc.). ITIL V3 does not include a specific process for workforce and talent management. The ITIL V3 publications provide some guidance on competence development and training. This ITIL 4 practice describes techniques for analyzing systems, processes, architectures, etc. Some of these techniques are applied in ITIL V3 processes, for instance as service requirements are defined during the service design stage. ITIL 4 includes some additional guidance for managing releases in Agile/DevOps environments. Service design is the second service lifecycle stage in ITIL V3, with design coordination and service level management as key processes. Service design in ITIL V3 includes further processes such as capacity management, availability management, IT service continuity management, etc., which correspond to the ITIL 4 practices of the same names. ITIL V3 refers to the service desk as a "function", whose activities are described in the incident management and request fulfilment processes. The ITIL 4 practice of deployment management explains various approaches to the deployment of hardware, software and other service components into the live environment. The ITIL V3 process of release and deployment management includes similar guidance on the various deployment options. ITIL 4 provides some additional advice for environments with multiple suppliers. This ITIL 4 practice is concerned with governing the use of technologies in the organization, including updated guidance on cloud services and cloud computing. There is very limited guidance on this topic in ITIL V3. The service strategy publication[a] includes an appendix with an introduction to cloud offerings and their impact on the service strategy. ITIL 4 provides a high-level overview of software development and management activities. ITIL V3 describes the application management function in the service operation publication[d], where similar content can be found. The ITIL 4 content referenced in this table is based on ITIL 4 Foundation, published in February 2019. 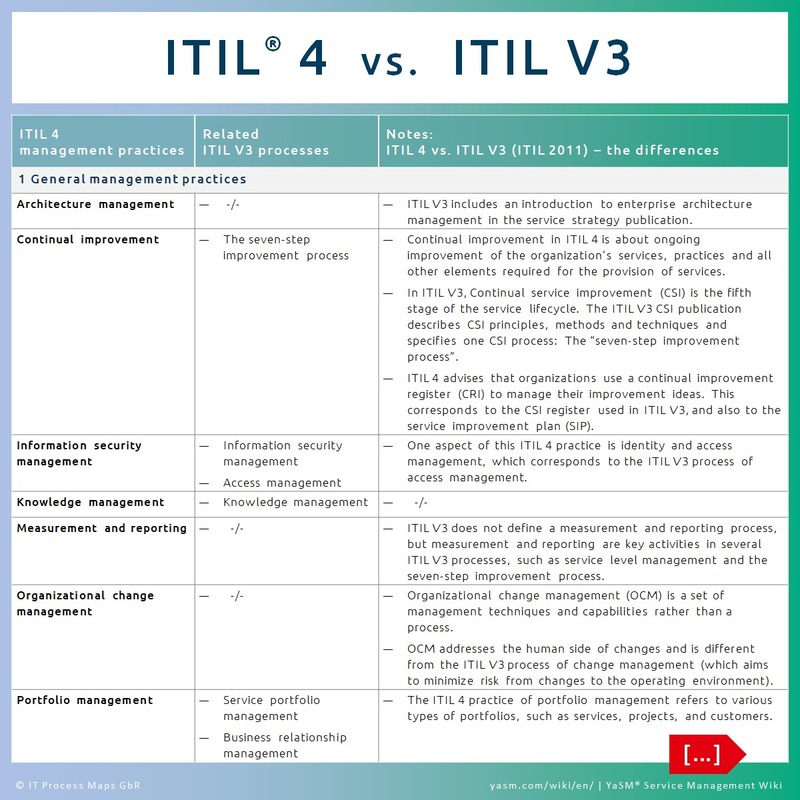 The ITIL V3 content referenced in this table is based on the 2011 edition of ITIL V3. SIAM® is a registered trademark of EXIN. VeriSM™ is a registered trademark of IFDC. The management practices in this table are based on ITIL 4 Foundation, published in February 2019. The ITIL V3 processes in this table are based on ITIL V3 2011.